We announced in July that we are planning more days for people interested in a career in design. We previously called it a student day, however we decided these events should be more open. We want to include everyone who is interested in a career change to design, so we’re calling the events career days. The structure of the days will be similar to the first one we ran. They will be all-day workshops about design in the public sector. The days will include an introduction to design in government, some deep dives into design projects from the public sector, and a practical session working on real projects. Attendees will work on a real project brief, analyse the existing research, and prototype their ideas. The days are for people interested in a career in design. There is no need to have studied design or to have work experience in design to attend. 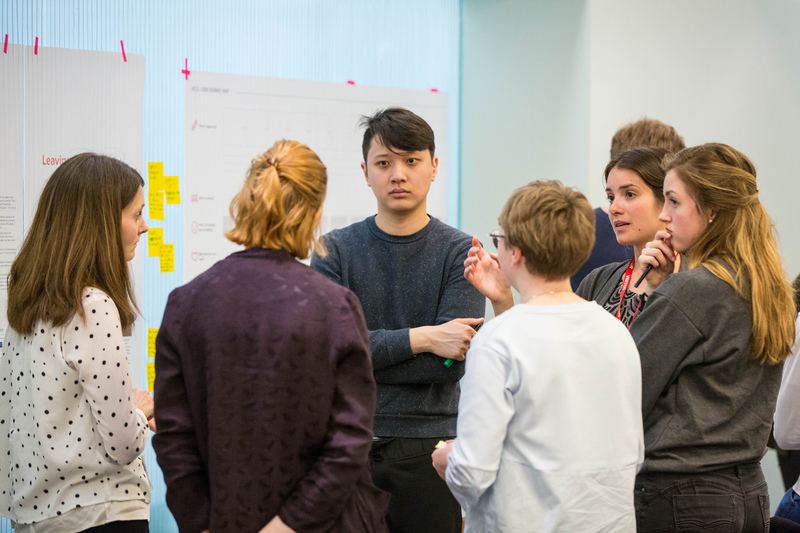 The aim is to show people the type of design work happening across the public sector, the typical roles that exist, what skills are needed, and to give people insights into agile and user centred ways of working. We’re iterating the structure of the day based on the feedback we received. Rather than only creating digital prototypes with the prototype kit, we’re going to introduce more ways of prototyping: paper prototyping, acting, or any other ways people come up with. The attendees showed interest in accessibility, so this time we will encourage people to consider who the different users of a service may be and if they might have access needs, then incorporate this thinking into their approach. The attendees really liked the tour of the GDS building so we’ll be running tours of government venues again: the new GDS offices and the Department of Education in Sheffield. People travelled from near and far to come to the career day. This time we are organising Gov Design events during the evenings on the career days so that attendees can have the opportunity to meet more people in the public sector and learn about other work going on. Gov Design is a meetup connecting designers working in, for, or with government and is open to those interested in working in the public sector. It was great to have a mix of case studies and volunteers from across the public sector like FutureGov, NHS Digital, and Ministry of Justice. We are going to aim for a similar mix making sure we get local government involved. People were curious about internship opportunities. We’re working on gathering public sector opportunities to apply for and a list of further events to attend. The Sheffield public sector career day takes place on 23 October at the Department of Education. Sign up on Eventbrite to attend. The London public sector career day takes place on 19 September at the Government Digital Service. Sign up on Eventbrite to attend. The tickets are first come first serve. We can only offer a limited number of places due the size of the venues. For current design job opportunities in government follow @digicareersgov or visit Civil Service Jobs and GDS design careers.